 Log In needed $2,095 · Trendy Eglinton West Gem, Not your Average Basement Suite! 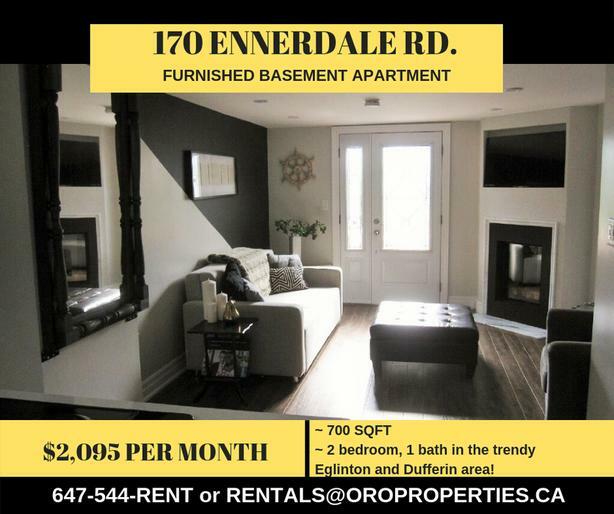 Space: Trendy 2 bedroom basement walk out suite at Dufferin & Eglinton, mere steps to all your needs!! Pets: While no pets are preferred, great pet owners are negotiable. Just ask about our pet policy. Welcome home to 170 Ennerdale- FULL Bungalow basement walk out suite. A lovingly renovated detached 2 bedroom bungalow situated on a quiet street near Eglinton West. Not only will you love this home, you will love this vibrant and established neighbourhood with its friendly community and a wide array of things to do and places to enjoy nearby! Step through your private entrance, and you are welcomed by an open foyer with tons of light! Laminate flooring unites the space and complements the griege walls, lending a clean and modern feel to this lovely home. Your spacious lower floor includes; a very attractive living room, with accent walls and character - ideal for gatherings. The living room mirror miraculously converts into a dining table! Creating a lovely generous dining space - perfect for entertaining friends and family all year round! Your bright and well-equipped kitchen is illuminated by a skylight! Enjoy natural light in the day and the stars at night.